Task Scheduler is a freeware task scheduling application that is integrated in Automation Workshop Free Edition and capable of launching a wide range of actions according to simple or complex schedules. A task scheduling application can be characterized by two sets of basic parameters, namely, the types of schedules that can be setup by a task scheduling application and operations that the task can actually do when executed according to its schedule. Both challenges are amply answered by Task Scheduler, a freeware task scheduling application that is included in Automation Workshop Free Edition. Task Scheduler itself features options for creating both simple and complex schedules. However, it is exactly its integration in Automation Workshop which accounts for the wide variety of actual operations it is capable to invoke. Free Task scheduler provides a solid basis for automating routine tasks of various regularity in different contexts. Task Scheduler can automatically start routine tasks on recurring schedule. From simple schedules like hourly, daily or monthly execution to more complex scenarios like the first and third Monday of every third month, Task Scheduler can take care of them all. Two or more Task Schedulers can be combined within the same Task to design even more complex schedules. Run built-in Actions as well as external programs, scripts, batch files at any time you want. 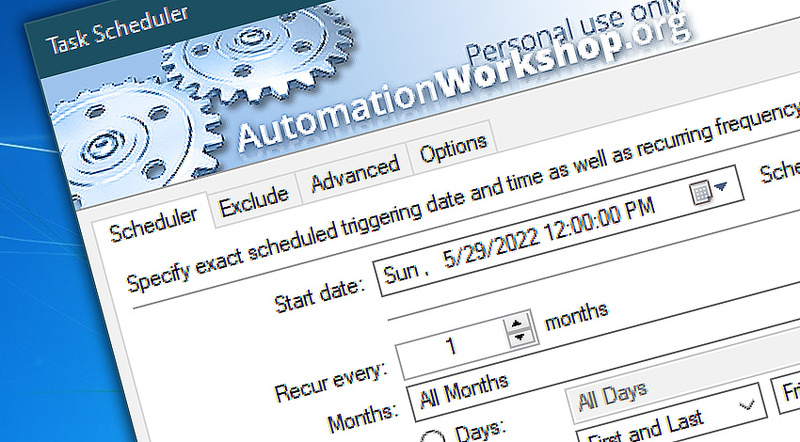 Automation Workshop runs as Windows Service and can schedule tasks even when no user is logged in. Just provide the credentials and the Task will be executed on behalf of specified user. Advanced freeware Task scheduler provides a strong set of features for creating the most versatile schedule of system automation events. Specify the date and time when the schedule starts as well as periods of recurrence. Run a Task once, secondly, minutely, hourly, daily, weekly, monthly, yearly or on less regular schedule. Repeat Task for multiple times within each recurrence period. Select months, dates, weekdays and / or times to exclude from schedule of routine tasks. Detailed overview of free Task Scheduler including the description of minute details is available on the website of commercial version of Automation Workshop. Overview · free Task Scheduler features and usage summary. Scheduler · specify the beginning and regularity of the schedule. Exclude · exclude particular months, dates, days of week or times of the day. Advanced · specify the end of the schedule and repetition options. Options · set triggering delay and enable or disable the Task scheduler trigger. Just wanted to say thank you for offering Automation Workshop for free. It has made my computing "rituals" a whole lot easier. Appreciate being able to use this without charge. —Bob G.